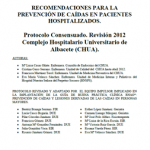 This document in Spanish, developed by the Complejo Hospitalario Universitario de Albacete (CHUA), addresses nurses and healthcare professionals working at hospitals. This protocol includes evidence-based recommendations to unify prevention and management criteria for decreasing falls risk and increase patients’ safety. 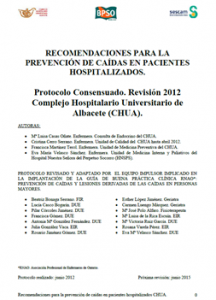 Protocolo: Recomendaciones para la prevención de caídas en pacientes hospitalizados (Complejo Hospitalario Universitario de Albacete, Spanish) Reviewed byKristin Taraldsen on April 08 .